This is the seventh installment of Hill Farmstead’s Society & Solitude series. All are Imperial IPAs (#2 was a black IPA) with different hop profiles. I have tried all but #1 and not sure if they will bring it back in the future or not. #7 uses a mix of Simcoe and Amarillo hops. 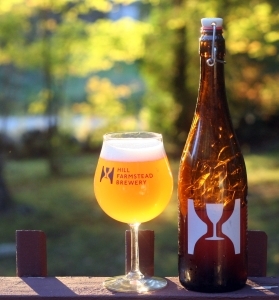 Everything about this beer is typical Hill Farmstead. Appearance is the bright unfiltered orange with a nice white head. Aroma has huge juicy citrus fruits; mango, grapefruit and a hint of pine. Taste is a very bright orange, grapefruit, melon and a slight sweetness. Slightly bitter finish and the alcohol is non-existent while cold. As the beer warms the alcohol starts to come through but it is not overpowering. Brewers Description: Imperial Pale Ale brewed exclusively with Simcoe and Amarillo hops from the Pacific Northwest.